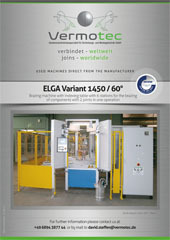 General Conditions of Service and Delivery | VerMoTec - Nr. 1 in der Löttechnik - weltweit! 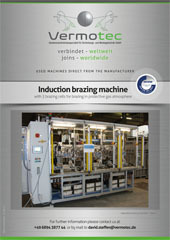 (1) All deliveries, services and offers of VerMoTec GmbH (subsequently also called “user”) are effected exclusively based on these General Conditions of Service and Delivery. These conditions are an integral part of all contracts which the user concludes with his contract partners (subsequently also called “customer”) on the deliveries or services offered by him. They also apply to all future deliveries, services or offers to the customer and do not need to be separately agreed upon. (2) Business terms of the customer or third parties will not apply, even if the user does not discount their validity in any individual case, insofar different terms will not apply. Even if the user refers to correspondence, which contains or refers to terms and conditions of the customer or a third party, this will not be understood as the user’s consent to the validity of such terms. (1) All offers of the user are subject to change and non-binding unless they are expressly marked as binding or contain a specific acceptance period. The user may accept orders or contracts within 14 days after receipt. (2) Solely decisive for the legal relations between user and customer is the contract concluded in writing including these General Terms of Service and Delivery, consisting of contract offer and acceptance. The contract reflects in its entirety all agreements between the contract parties concerning the contents of the contract. Oral commitments of the user prior to the conclusion of this contract are legally non-binding, and oral agreements between the contract parties will be replaced by the written contract, unless their continued applicability is expressly concluded from these agreements. Any additions or modifications of the agreements including these Terms must be drawn up in writing to be valid (constitutive double written form requirement). With the exception of chief executive officers or authorized signatories, the employees of the user are not authorized to make deviating oral agreements. The transmission of a document through fax will suffice for keeping the written form, apart from that the transmission by telecommunication, especially through email, will not suffice. (3) Information which the user gives about the object of the delivery or service (e.g. weights, dimensions, usage data, load, tolerances and technical data, etc.) as well as the depiction of the same (e.g. drawings and graphics) are only approximately decisive, unless the usability for the purpose stated in the contract requires a precise conformance. They are not guaranteed characteristics but rather a description and characterization of the delivery or service. Customary deviations and such deviations as result from legal regulations or which are technical improvements, as well as the replacement of component parts with parts of equal quality are admissible unless they impair the usability for the purpose stated in the contract. (4) The user reserves the ownership or copy right on all offers and cost estimates as well as drawings, pictures, calculations, brochures, catalogues, models, tools and other documentation and aids. Without the expressed consent of the user, the customer must not make these items themselves nor the contents of these items accessible to third parties, publish them nor use or copy them himself or have third parties use or copy them. On the user’s request, he will return these items to the user in their entirety and will destroy possibly made copies once they are no longer required for due business proceedings or if negotiations do not lead to the conclusion of a contract. (1) The prices are valid for the scope of services and delivery stated in the order confirmation. Additional or sepecial services will be charged separately. The prices are to be understood in EURO ex works, excluding packing, unloading, transport insurance and legal Value Added Tax, in the case of export deliveries excluding customs, fees and other payable duties. (2) As far as the agreed prices are based on the user’s list prices and the delivery will only be effected more than four months after conclusion of the contract, the user’s list prices valid at the time of delivery will apply (minus a possibly agreed proportional or firm discount). (3) Invoice amounts are payable within 30 days without any discount unless something different has been agreed in writing. Payment date is the date when the user receives payment. Checks will be considered paid only after they have been cashed. If the customer does not make payment by the due date, interest will be added onto the outstanding amounts in the amount of 8 percentage points above the base interest rate p.a. current at the time; the enforcement of higher interest and further damages in case of further delay remains unaffected. (4) The compensation of counterclaims of the customer or the retention of payment due to such claims is only admissible insofar as such counterclaims are indisputable or legally determined. (5) The user is authorized to execute still outstanding deliveries or services only against prior payment, if he learns after the contract conclusion about circumstances which would be suitable to considerably diminish the creditworthiness of the customer, and which would endanger the payment to the user by the customer of any outstanding claims resulting from the existing contractual relation (including from other individual orders under the same framework contract). (1) Delivery will be effected ex works. (2) Periods and dates of delivery and services estimated by the user are only approximate unless a firm period or date has been promised or agreed. Insofar as delivery was agreed, delivery periods and delivery dates are the point in time when the merchandise is handed over to the carrier, hauler or otherwise to a third party commissioned with the transport. (3) The user can – irrespective of his rights arising from a delay on behalf of the customer – claim an extension of delivery and service periods or a postponement of delivery and service periods by the time in which the customer has not fulfilled his contractual duty towards the user. (4) The user is not liable for the impossibility of a delivery or for delivery delays, insofar as those are caused by force majeure or other incidents unpredictable at the time of contract conclusion (e.g. the disruption of operation of any kind, difficulty in the procurement of material or energy, transport delays, strikes, lawful lockouts, shortage in manpower, energy, or raw material, difficulties obtaining necessary regulatory permits, regulatory measures or a missing, incorrect or delayed delivery by suppliers) and which the user is not responsible for. Insofar as such events complicate the delivery or service substantially for the user and the impediment is not only temporary, the customer is authorized to cancel the contract. In case of temporary impediments, delivery or service periods will extend or be postponed by the time of the impediment plus an appropriate starting period. Insofar as the customer cannot be expected to accept the delivery or service as a result of the delay, he may cancel the contract by immediate declaration in writing. (6) If the user falls behind with a delivery or service or is unable to execute a delivery or service, regardless of the reason, the user’s liability for compensation for damages is limited to what is stated in §8 of these General Terms of Delivery. (1) Place of Performance from the contractual relations is 66386 St. Ingbert/Germany, unless something different has been determined. If the user owes the installation, assembly, etc., as well, the place of performance for these services is the location where the installation has to be made. (2) The type of shipment and the packing are the user’s dutiful discretion. (3) The risk will pass to the customer at the latest when the item is handed over to the carrier, hauler or otherwise to a third party commissioned with the transport (determining is the start of the loading process). This applies to any partial deliveries, as well, or to other services the user owes (e.g. delivery, installation, assembly, etc.). If the shipment or the transfer are delayed due to a circumstance for which the customer is responsible, the risk will pass over to the customer on the day that the user is ready for shipment and has informed the customer accordingly. (4) Storage cost after the passing of risk will be borne by the customer. If the user is in charge of storing the items, storage will cost 0.25% of the invoice amount for the items to be stored per commenced week. The enforcement and the verification of further or lower storage cost remain reserved. (5) The user will insure the shipment against theft, damage through breakage, transport, fire and water or other insurable risks only on the customer’s expressed request and at the customer’s expense. – the customer has failed to perform the acceptance for a reason other than a defect indicated to the user, which would render the use of the purchased item impossible or considerably impair its use. (1) The warranty period is one year from the date of delivery or, insofar as an acceptance is necessary, from the date of acceptance. (2) The delivered items must be inspected without delay after handover to the customer or any third party designated by the customer. The items are considered approved unless the user receives a notice in the format stated in §2 (2) concerning obvious defects or other defects which were discernable in an immediate and thorough examination, within seven business days after handover of the items, or otherwise within seven business days after discovery of the defect or the point in time when the defect was discernable for the customer during regular use of the delivered item without closer examination. At the user’s request the object of complaint must be returned to the user free of charge. In case of a justified notice of defect the user will reimburse the customer with the most economic shipment cost; this does not apply if the shipment cost increases because the object of complaint is in a location different from the location of designated use. (3) In case of material defects at the supplied items the user is first obligated and entitled to a rectification or substitute delivery, this at the choice he makes within an appropriate period. The user may exercise this right twice. In case of failure, i.e. the impossibility, unreasonableness, rejection or inappropriate delay of the rectification or substitute delivery, the customer may cancel the contract or reduce the purchase price appropriately. (4) If a defect is caused through the user’s fault, the customer may claim damages as per the conditions stated in §8. (5) In case of defects on components of other manufacturers which the user cannot eliminate due to licensing restrictions or practical reasons, the user will exercise his warranty claims against the manufacturers and suppliers or transfer such entitlement to the customer. In case of such defects, warranty claims against the user, under the other conditions and according to these General Terms of Service and Delivery, will be valid only if the legal assertion of the aforementioned claims against the manufacturer and supplier has failed or is pointless, for example due to insolvency. The expiration of the warranty claims concerned of the customer against the user is suspended for the duration of such litigation. (6) The warranty will not apply if the customer modifies or has a third party modify the object delivered without the user’s consent, which has made the elimination of defects impossible or unreasonably complicated. In any case, the customer has to bear the extra cost of the defect elimination caused by the modification. (7) A delivery of used items agreed with the customer in an individual case will be made without any warranty. (1) As per this §7, the user is responsible that the object delivered is clear of commercial property rights or copy rights of third parties. Each contract partner will inform the other partner immediately in writing if any claims were to be raised against him due to the violation of such rights. (2) If the object delivered violates a commercial property right or copy right of a third party, the user will through his choice and at his expense modify or replace the object delivered so that any rights of third parties will not be violated any longer but the object delivered will still fulfill its contractually agreed functions, or he will procure for the customer the right of use by concluding a license contract. If he fails to do so within an appropriate period of time, the customer has the right to cancel the contract or to reasonably reduce the purchase price. Any claims for damages of the customer are subject to the limitations stated in §8 of these General Terms of Delivery. (3) If the rights of products of other manufacturers delivered by the user are violated, the user will through his choice exercise his claims against the manufacturers and sub-suppliers on behalf of the customer, or he will transfer his claim to the customer. Claims against the user, according to this §7 will be valid only if the legal assertion of the aforementioned claims against the manufacturer and sub-supplier has failed or is pointless, for example due to insolvency. (1) The liability of the user for damages, regardless of the legal reason, especially due to legal impossibility, delay, defective or wrong delivery, contract violation, violation of obligations during contractual negotiations and unlawful act is limited as per this §8, insofar as fault is concerned in each case. b) in case of gross negligence of his non-executive employees or other agents, insofar as it is not a violation of contractually essential obligations. Contractually essential is the obligation for a timely, faultless delivery and installation as well as the obligations of consultation, protection and care, which are to enable the customer to use the object delivered according to the contract or intend to protect from major damage of life and limb of the customer’s staff or third parties or the customer’s property. (3) Insofar as the user is liable on the merits for damages according §8 (2), such liability is limited to damage which the user foresaw at the conclusion of the contract as a possible consequence of a contract violation or should have foreseen using care and attention and taking into account the circumstances which he knew or should have known. Indirect damage and such damage which is a consequence of defects of the object delivered, is liable to compensation only insofar as such damage is to be typically expected with the designated use of the object delivered. (4) In case of a liability for simple negligence the user’s obligation to compensation is limited to an amount of EUR 1,500,000 for any one case of material or personal damage, and EUR 1,000,000 for any one case of pecuniary loss, even if it involves a violation of contractually essential obligations. (5) The aforementioned liability exclusions and limitations apply to the same extent to all bodies, legal representatives, employees and other agents of the user. (6) Insofar as the user gives technical advice or acts as a consultant and such advice or consultation is not part of the service he owes as per contractual agreement, such action is free of charge and excludes any liability. (7) The limitations of this §8 do not apply to the user’s liability for intentional behaviour, for guaranteed characteristics, for a violation of life, body or health or his liability as per the product liability law. (1) The retention of title agreed in the following serves for securing all existing current and future claims of the user against the customer resulting from the relations of service and delivery between the contract parties (including balance claims deriving from a current account limited to these delivery relations). (2) The goods delivered to the customer by the user remain the user’s property up until the complete payment of all secured claims. The goods as well as the subsequent goods covered under the retention of title according to this clause will be referred to as reserved goods hereafter. (3) The customer will store the reserved goods free of charge for the user. (4) The customer is authorized to use or sell the reserved goods until the point of enforcement (par. 9) in regular business operation. Hypothecations and chattel mortgaging are not allowed. (5) If the customer processes the reserved goods, it is agreed that the process is effected in the name and on the account of the user as the manufacturer and that the user will immediately acquire ownership, or joint ownership (partial ownership) of the newly created goods in relation to the value of the reserved goods to the value of the newly created goods – in case the production contains materials from several owners or the value the newly created goods is higher than the value of the reserved goods. In case no such acquisition of ownership goes into effect for the user, the customer shall already now transfer to the user his future ownership or – in the aforementioned relation – joint ownership of the newly created goods as the user’s collateral security. If the reserved goods are combined with other goods to create new uniform goods or if they are inseparably mixed with other goods and one of the other components is to be regarded as the main goods, the user, insofar as the main goods belong to him, will transfer to the customer the share of joint ownership in the uniform goods in the relation stated in sentence (1). (6) In case of a resale of the reserved goods, the customer shall for reasons of collateral security of the user already now transfer to the user the resulting claim against the buyer either entirely or partially – in case of joint ownership of the reserved goods according to the share he owns. The same applies to other claims which will replace the reserved goods or otherwise arise regarding the reserved goods, as e.g. insurance claims or claims from unlawful acts in the case of loss or destruction. The user revocably authorizes the customer to collect claims transferred to the user in his own name on account of the user. The user may revoke this direct collection authorization only in case of an enforcement. (7) If third parties access the reserved goods, especially also through hypothecation, the customer will immediately advise them of the user’s ownership and will inform the user about it to enable him to enforce his ownership rights. If the third party is not able to reimburse the cost created in court or outside of court to the user, the customer will be liable for such cost. (8) The user will release the reserved goods as well as the items or claims replacing them according to his choice insofar as their value exceeds the amount of the secured claims by more than 50%. (9) If the user cancels the contract in case of the customer’s behaviour contrary to contract – especially payment delay (enforcement situation), he is authorized to claim the surrender of the reserved goods. (1) Exclusive Court of Jurisdiction for any litigation resulting from the business relations between user and customer is, per our choice, 66386 St. Ingbert/Germany or the location of the customer. For claims against the user, exclusive Court of Jurisdiction is 66386 St. Ingbert/Germany. Mandatory legal regulations concerning exclusive Courts of Jurisdiction remain unaffected. (2) The relations between the user and the customer are subject exclusively to the law of the Federal Republic of Germany but excluding the United Nations Convention on Contracts for the International Sale of Goods (CISG). International private law will not apply. (3) Insofar as the contract of these General Terms of Delivery contain eventual loopholes, legally effective regulations stand as agreed to fill them, which the contract parties would have agreed on according to the commercial contract goals and the purpose of these General Terms of Delivery, had they known the loophole.